The Atmos Q3 is a powerful wax consistency vaporizer that uses a pure triple quartz atomizer, combined with the new versatility of both manual and automatic operation modes to produce rich and potent vapor. It is compact and encased in a durable scratch-resistant rubberized finish for added portability. Equipped with a powerful 1100mAh lithium-ion battery, the Q3 will provide an impressive amount of cycles before needing to be recharged, and with a variety of other features including: a high-speed heat up time, an easy access glass mouthpiece, Atmos' patented spring loaded connection, micro-USB charging, and an easily interchanged atomizer, the Q3 establishes itself as one of the most convenient devices for portable wax consistency vaping. Interested in water filtrated percolators? 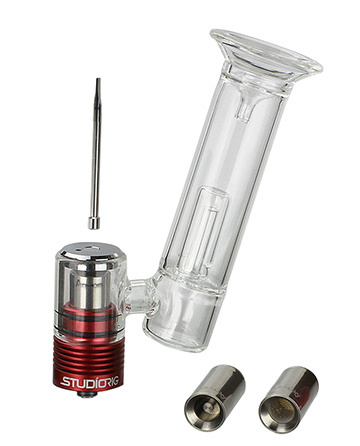 Check out the Q3 Percolator Attachment, sold separately.